At Brandfield you buy the best Le Specs sunglasses, like this Le Specs Air Heart Black Gold-coloured Sunglasses LSP1602175. This sunglass is made of plastic in the color black and gold. The glasses are dark brown. With the Le Specs Air Heart Black Gold-coloured Sunglasses LSP1602175 you protect your eyes with style! 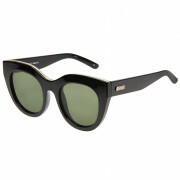 Buying a Le Specs sunglass at Brandfield is safe and easy in our online shop. We are official dealer of Le Specs sunglasses. Take a look at the complete collection of Le Specs sunglasses in our online shop.